Zo, dat is weer eens een heel ander soort kerstboom. Dr. Peter Terren is erin geslaagd om met wat enorme stroomstoten en met behulp van wat techniek verbazingwekkende beelden te creëren. 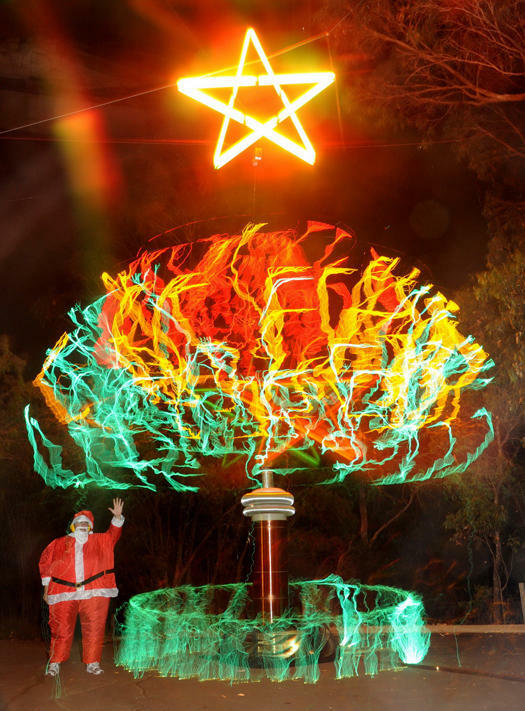 A physics fanatic down under is having a very Tesla Christmas this year, creating a 30-foot electrifying display of yuletide cheer by attaching a rotating rod to the top of a Tesla coil, making for quite the colorful Christmas tree. Using such specialized science tools as a fishing rod and sinker, household power, and a Nikon D300, physician and Tesla buff Peter Terren manipulated 500,000 volts at a time to produce these images.